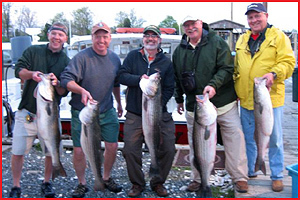 Captain Bunky Conner's 40+ years experience fishing the Chesapeake Bay really paid off for this customer, who caught this 50 inch Rock Fish while on a charter aboard the Kathy C.
We went fishing last month (4/28/07-afternoon) aboard the Red Osprey. Four out of the five of us had never been fishing before. 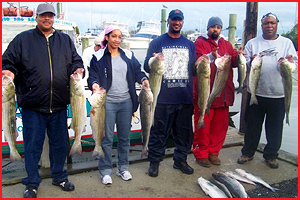 We had great fishing – caught our limit and Capt. Simon was tops. Everyone was so pleased and enthusiastic, they are all pressing me to organize the same great trip next year. Every body works except me, which creates some scheduling problems. That is why I am attending to this so early. We need a certain weekend to make it work for everybody. Would it be possible to book the first weekend in May for next year? That would be either Saturday May 3 or Sunday May 4 for the morning trip. Prefer Sunday, but will take either date. Red Osprey again also, if possible. Brian - Thanks again for the trip this past Saturday. Our guys had a phenomenal time!! As promised, attached are a few pictures from the trip. Once again, another superb day on the Kathy C with Captain Bunky. I am always astounded by his ability to catch fish, even when others are not. I have brought many of my family and friends back to Captain Bunky because of his outstanding professionalism and work ethic to his craft. From little ones to the big one, we always leave Captain Bunky's with a smile. Kelly Moore, David D., Jeff Muller and Tony Christiani were so excited about the 43” Rock Fish they caught on an Umbrella Rig made in our store that they had to come back and show us. We all had a great time on the Kathy C (as always), and look forward to our next trip. A word of thanks for a great trip Saturday. I have been on many a Head Boat and the trip with you was the best. We took your 3 pm Head Boat Sat. night with Captain Brian. He did a great job, and was all action and no talk. He went above and beyond, as well did the first mate with the white tank top who lent us the filet knife. Thanks again, see you next time when Stripers come in. We had chartered the Red Osprey back on April 24, 2009 and had a very successful day! Simon was an outstanding Captain! 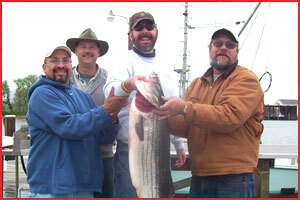 One of our group is a fishing column writer in Michigan. Monroe, Michigan to be specific. I had sent you a link to his newspaper column where he mentioned Bunky’s and Simon. Anyway, I just came across some pictures from our charter on the Red Osprey and thought I’d send them to you! You may see us again this fall, as my boat (at Spring Cove Marina) is still laid up. Feel free to use the pictures if you wish! First and foremost I want to apologize for my delay in sending the pics and video clip from our trip from Saturday. Kyle is still trying to get the clip from the phone which was more intense and hopefully we can forward it to you asap. I am pretty sure that your comrades will not believe your story about our experience out especially the part where we threw more Rockfish back than we caught. But if anybody doubts you tell them to email me and I will give them a full detailed story and add in that a Guardian "Angel" Bunky being his name somehow found his way out on the Kathy C on that day. You have our full permission to utilize our photo's and video clips for the sole use of Bunkys Charter Boats for advertisement purposes!!!! Our group uses Bunkys Charter Boats twice a year when we camp out at the nearby Naval Center. We usually prefer the Kathy C and crew for they are like family to us, and while out on the water they are not captain and crew but part of our group. 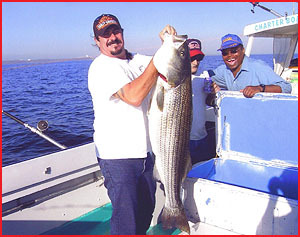 Their years of experience and knowledge of the waterways makes any fishing expedition with them a guaranteed success. The aggressive attitude that demonstrates and contributes towards making a common goal.....Not sitting on a boat all day looking for fish but going out and bringing them in. Thanks again Brian for your aggressive attitude, sense of humor, and no nonsense we are here to fish leadership!!! Once again Brian thanks alot to you and Jimmy for making our trip the BOMB!!!!! Want to thank you again for the above and beyond effort to make our father’s Day trip yesterday a success. 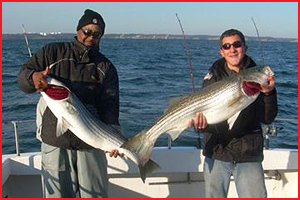 You and first mate are awesome and have gained loyal customers – Many of them! We’ll be back in September!!! Thanks again for a second outstanding charter. We had a great time and hope to do it again soon. Captain Simon really showed us a great time. 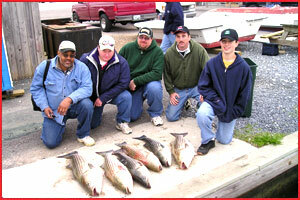 Easy to say best time we ever had striper fishing.